The Art of Drafting – are we losing it? Way back when, when all the drafting functions were done with a mechanical pencil in hand there were many talents that a drafter had to develop in order to make plans readable. The artistic flavor of their lettering was developed over time. The twist of a pencil to make consistent line weights was an artistic talent that did not come easily. The use of splines, templates and triangles to create the exacting angles and curves needed was a learned talent. Generations of master drafters have marched forward passing on the techniques from one person to another. Each one taking what was learned from the past and adding their own little flare in the nuanced fonts they created by hand. Each one was building upon the process of years of manipulating paper and pencil to document the designs to be built. And it was not all just the scratching of lead on vellum. It included the wisdom and knowledge of how to communicate what needed to be conveyed. It was learning and presenting on paper the methodology of plan views, enlarged plans, sections, cross sections, orthographic views, diagrams, schematics and so much more. It was using the proper combination of what diagram goes with what plan. It was combining the correct chart to assist a specific view. On the grandest scale it is which plan comes before others and which sheet preceded the next. It was the flow of the information in the set. 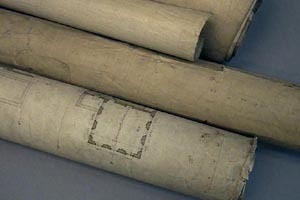 It is how plans reference a detail. It is how sections support plans. Are these talents no longer needed? Have you seen sets of plans put together that make little or no sense? Do you see contractors making extensive change orders and generating overwhelming levels of RFI’s because the plans are not clear, or do not match or the references are wrong? 26 Comments To "The Art of Drafting – are we losing it?" Personally what I have found is that with the advent of 2D CAD based drafting we have lost some of the benefits of thinking about what we are drafting. Typically when hand drafting we have the luxury of time to think about what lines we are drawing and what they represent, we get a global view of the project as it’s spread out over our board. Each line had a function and place in the project, we put a lot of thought as to exactly what we are doing as the consequences were immediate.. ever tried to erase a ink line on vellum or Mylar? AutoCAD came along and with is the benefits of speed but we did loose some of the benefits of hand drafting mentioned above. I have been fortunate that in my 20+ year career I was fortunate to learn on the board, migrated to CAD (thought the 12″ screen was too small and couldn’t see the whole project) and now to BIM software. What I find now with BIM software is that it gives you the design perspective back! Now when you place elements you are actually building the building…. virtually. You can see the consequences of what you place where and the impact of what you input immediately, giving back the benefits of thinking about what we are drafting. Much of what you list should be lost, a couple of things can’t be. I compare some of the lings you list like line weights, and letting to things still being taught in elementary schools today such as cursive writing. The computer has automated a lot of these tasks giving the user more time to focus on design and less time needed to do mundane non-value added tasks. I do agree with you that 2D drawings are very much needed to convey the design for manufacturing. CAD should allow us to focus even more on this since we don’t need to focus on learning how to do the little things. Let the computer take care of that part. Thanks for commenting… This topic is still unfolding. Keep reading and commenting as I continue to post. Thanks for posting. As I continue to post on this topic you will see that I am not trying to hold tight to the past. Far from it. But the past should be used to build the future. I am taking a higher view of things. Will we ever need to hand letter a drawing again? – NO. Do we need to have students learn how to hand letter – not any more. But the desire for great lettering pounded into my head was one perspective that pressed me forward toward excellence in other areas. We should be careful with the areas we allow to be “good enough”. They are the enemy of Better and Best. We need to think about the things that we “used to do” for the lessons they teach us about the great things we are doing now and will be doing in the future. I think you and I are closer in thought pattern than you think. Speaking from the point of view of a contractor in the building industry, many drafters go to night school to learn ‘CAD’, but few ever get taught how to draw. By that I mean, how to communicate clearly through a drawing, how to apply drafting standards, how to compose a drawing set. Recently, one of our freelance drafters retired. he was in his 70’s and never learned to use a computer. Despite the difficulties of sharing hand drawn information, the company still employed him. Why? Because of his expert knowledge of his subject – not his (non existent) CAD skills. And the point to note is that he wasn’t that much slower at producing his drawings than us CAD jockeys. He knew his subject so well that he knew exactly what information he needed to put down to communicate the design intent, making him an incredibly efficient drafter. I agree with Scott, that while I loved drawing by hand, modelling in 3D gives a far better perspective on what it is you are actually building. However, I still know that there I have lessons to learn in communicating that 3D model to the workshop or building site effectively. While builders need information that they can reproduce cheaply and roll up and stick in there pocket, there will be a place for 2D drawings – no matter how the design was developed. Above all the drawings should give clarity and understanding to the project – or they simply aren’t doing their job. Today I teach people, at work, how to use cad, & get the views they need. In school they are taught to use the software & what commands to use, but not how to make views. 3D has help because you can now make the views But what about our visualization & imagination? those are the next to go. I’ve been doing drafting and design for 35+ (Yikes!) years. I started board drafting and moved in to Autocad and in recent years to BIM (Revit, C3D, etc.). The one thing I’ve noticed (similar to those who posted before me) is we have folks that can push the buttons and make drawings but don’t fully understand what they are creating. The “art” is lost. I agree with Scott C., with BIM you have to consider the design once again before you start making sheets. I’m glad to see a return to the two evil twins, Forethought & Planning!!! As each new generation of architect joined the firm, he came equipped with a brand new approach to cad as promoted in his or her university. The project architects became responsible for reviewing the drawings and soon the drafting captain had no work and retired. Individual studios cropped up and standards became a distant memory. As I was archiving some material from a recently retired associate, I came across a folder full of sticky backs and transparencies with the label “office standards” on its tab. The most recent date on anything I found was 1967. When we moved to a new office 3 years ago I lifted the monitors off of vico mats so yellowed with age that only the place where the monitor rested was still white. I wrapped up about 20 or so parallels and deposited them in the dumpster. The following morning as I sat in front of my pristine workstation and stared at my new flat panel monitors sitting side by side, their glow reflecting on the high pressure laminate of my work surface, I felt a slight pang of nostalgia. Not one of our workstation has a parallel on it. We did eventually purchase four portable boards for those who had to have a parallel. Two of the users have retired since and their boards lay empty. The other two are buried under several inches of review sets on back tables. One of my secondary roles in the office is that of company archivist. In that pursuit I have personally handled nearly every scrap of paper generated since our office opened in 1927 and processor drawings going back as far as 1918. I have ink on linen drawings that are as crisp and vibrant as the day that ink was laid down almost 94 years ago. Now that was drafting! I can show you the sequence of drafting from linen to vellum to mylar to bond and from hand to machine to zip-a-tone to computer. The transition from ink and lead to lines, arcs, and circles was stark and lifeless. Drafting lost all of its character. But the same can be said of the transition from straight edge to drafting machine and then to sticky backs and zip-a-tone. I have seen a pattern appear. With each advance in technology the art of drafting has diminished. Or has it? Early machine drafting became more sophisticated and warm as the art of drafting transformed to the new tools. Early computer drafting looks cold as compared to newer more experienced work. I hear from my colleagues that Revit drawings lack character and depth and that they will never replace cad drawings completely. Familiar words? Like 10 years ago when people said that digital would never fully replace film as medium? When is the last time you saw a rack of Kodak film on a pharmacy checkout counter? BIM and three dimensional drafting WILL replace 2d drawings. When is a matter of conjecture and not really relevant to the point. We aren’t loosing drafting skills, we are transforming them. Just as we have through every paradigm shift and just as we will in the next. I started my career as a board drafter and started using CAD in 1985. I remember a board drafting problem in trade school- doing an isometric view of a machine part. It was a killer because it was a angled bracket with 45 degree skews in 2 directions. Everyone struggled with it, but it taught you how to visualize a 3 dimensional shape in your mind. A skill need more than ever as we move into BIM softwares. People look at CAD as a problem solver that does the work for you. It is no different than a pencil. It is a tool and only works as well as the person operating the tool. Memorizing commands and shortcuts does not replace critical thinking. Great thought-provoker, thanks, Mark. I’ve been trying to point this out for years, so it’s nice to see someone else bringing up the same subject. It’s important. I spent a year doing CADD support after 25 years as a piping/plant designer/draftsman just to see what the techies had to deal with and I came to appreciate what they do. I am new in this forum and also I am a beginner in am English language because my second language is French, not problem the important is communication. Really the pencil becomes day after day forgettable and the machine became necessary for the resolution of our technical problems, we forgot pencils HB and 2H, the pens ROTRING, the table of drawing, the famous red book CHEVALIER (for the draftsmanship) and the bleu book for piping (trouvay and cauvin). The drafting packages make it possible to save to us only time, but for the detection of the error at the time of the design is really impossible, because that sometimes happens to me to detect errors after the impression of the plan. I started the drafting 27 years back.Still I remember the olden days,which we had a Guru (Teacher). He knows how to mould the drafter.But today drafters are interested only to familiar with softwares. I think the art of drafting has turned into the art of CAD operating. I would much rather see a new cadet drafter have high marks in graphics or drafting throughout highschool. Usually we have to “beat out” their bad habits they have learnt when using CAD. Sure it can do a lot of fancy thigs, but often they are time consuming and not needed at all. I could teach someone to use CAD in a month. It would take a year or more to teach them to be a drafter. I was ‘brought up on a drawing board’ and did go into AutoCAD 2D from version 2.6 to 11 before I became more involved as an Engineer rather than drafter. I still like to keep my hand in and never forget my skills. When you are drafting, you are engineering. You are building the project on paper. What I have seen over the last 2 years in the UK, is that graduates, masters degree ‘engineers’ who are now in high positions in the company, just simply cannot read a drawing let alone produce on. Most want to see a 3D model so they can ‘see what is going on’. I remember that technical drawing at 14 – 16 years old in school was a vital learning curve well before I started my drafting apprenticeship. It no longer happens in schools but this should be learnt before CAD. I started my draughting career as a tracer in 1978, I had completed 12 months night school learning how to write in a ticket writing class before I started draughting. I literally started from the printing room and filing first long before I could touch a drawing board so I was office taught from the ground up. In doing this I understood how printing occurred, and drawing sets and signatories, the engineers of the various levels to complete a project. I was also conversant in not one discipline but multiple disciplines and worked in two countries in both hemispheres and was asked to work in a third. In my own country Australia I was just a tracer, in London I was a detail draughter and important to companies as I was able to work with layers of different disciplined drawings on my board and/or layout table. I could move easily from electrical drawings to mechanical and structural without thinking time to re-orientate from one discipline to the next. That is higher order thinking, I with my collegues could turn around a drawing from design concept to contract ready in fortnight when it was the norm to take 4 to 41/2 months errors were fixed in the main before the drawing left my board and rarely came back for changes unless there were major design changes. With the CAD draughters coming into offices in the late 1980’s early 1990’s they had no concept of what their job entailed they didn’t seem to understand their job was to create engineering drawings. They could use the CAD programs and wasted Draughty time repairing their errors which they were not interested in learning why or what they were doing wrong concerning drawing conventions. Oh I did work on several CAD programs but was frozen out and called a dineasaur for knowing my job well. Now as an educator, research confirms what I am writing today the bath should not be thrown out with the baby, but it has now, we are back to reinventing the wheel again. I am also not lamenting the past but computers are just tools like drawing stencils, pens and pencils the operator has to drive the programs in reality and that takes visual knowledge and understanding, and drawing knowledge includes spatial knowledge and understanding. I had 12 years on the board. I felt like an artist most of the time. I was very good at Isometrics and Perspectives. I brought that into every company I worked for. That totally disappeared. I enjoyed that aspect of my career and prided myself on acquiring that skill. I have only old drawings to remind me of the joy I had drawing those. Drafting IS art. It is gone now. I am not an architect! – and never was 🙂 I’m actually now an engineering consultant in the medical device world. One cool aspect of my education is that I took drafting classes on the board in high school, went to a junior college, then finally finished up at CAL. I worked my way through CAL as an associate engineer, where I worked with 3 of the original 13 AutoCad founders . . . before they banded together to form AutoDesk. At that time, as an ‘associate engineer’, I got to work ‘on the board’. So I happened to be in at the beginning of the CAD revolution, when those of us Mechanical Engineers not working for large companies never got to sit at a $100,000 CAD seat. I started working in small companies with a beta copy of AutoCAD. I was late enough that I only got about 1 year of experience in industry where there was a large drafting staff working in a large room filled with tables. As an engineer, I didn’t get to work ‘on the board’ after college. I loved interacting with the drafting staff for that one year. I was an early adopter of AutoCAD, so I got to experience the difficulty in the early years of creating ‘good’ CAD ‘Drawings’. Someone earlier in the thread mentioned drawing exercises, creating three view drawings of a part that was challenging. I got to work with those sorts of parts . . . in early CAD. Now, having used AutoCad, Pro-Engineer, and Solidworks in mechanical engineering, I’ve run into an interesting situation. Since Solidworks has issues between ‘past versions’ and ‘future versions’, and I’m working with a large number of clients . . . the value of having a paper copy of a drawing is becoming an interesting aspect of my work. I’m also finding it useful as we go out and get estimates for components. Machine Shops can work from CAD, but they like to quote from paper. So I’ve come full circle and I’m teaching younger people how to detail drawings. And I’m searching for the ‘art of drawing’ as I try to explain why you’d place dimensions in a particular place on the page. It’s a skill, and an art. I’m gratified to be passing it on to another generation. I am a engineer, 72 years old and,of course, took drafting 2 years in high school and 2 semesters in college. However, I switched to the business side and did most of my working days doing proposals which required very complex financial spreadsheets which were originally done on vellum and then copied as blueline which similar to the drawing process forced a considerable and valuable up front thought process that was mandatory to work on vellum. The computer generation does not “think” , it does. Their technique is to generate via computer and iterate until satisfied with the answer. It is frustrating to see the blank faces on the kids when you try to draw out some up front thinking before plunging into the computer. My brother is an architect who still does it on the board first. Knowing Cadd is very different from knowing drafting. Cadd is just a one of the tools used for drafting and it is not drafting itself. Drafting or “Technical Drawing” is not just knowing how to use or knowing the commands, functions of a computer drafting software. “engineering drawing requires some training to understand (like any language); but there is also a high degree of objective commonality in the interpretation (also like other languages). In fact, engineering drawing has evolved into a language that is more precise and unambiguous than natural languages; in this sense it is closer to a programming language in its communication ability. Engineering drawing uses an extensive set of conventions to convey information very precisely, with very little ambiguity.” – from wiki. I always tell young engineers that engineering plan are not meant to be interpreted. It should convey exactly what you want or what the design is intended to be. A plan set fails its purpose is when next person looking at it tries to figure it out. And technical drawing is an art. Have you seen a plan sheet that is not balance? Composition – placement of notes, line weights.. negative and positive space. An effective plan sheet not only conveys its intention directly, precisely and effectively but also presents its content in an organized and artistic way which subconsciously affects the mood of the person reading it. It is a skill learned overtime and not by just one semester of drafting. It is easy enough with today’s technology to draft but still less effort is taken to make the plan right. Just imagine when Cadd was not around yet. You have to layout or imagine where your object will be in a 24x 36 sheet. Its scale, necessary notes and other elements before you start drawing it. Because revising it will be no fun. And yet with the ease of revising drawing in a computer, plans produced today are nothing and can’t be compared to the plans done on a drawing table with HB pencil, set of french curbs, t-square and lettering guides. I think the reason is enough people have more experience with gadgets than working with their hands. I drafted by hand until roughly 5 years ago; going from hand to Revit. When Cad first started to make headway in the Mid-80’s, I immediately noticed a substantial difference in temperament also. In other words, I hear you. ADDENDUM: One the issues I have currently is the time it takes to become productive with Revit and the learning of Codes taking a backseat …. until the very near future. Hi, I am an artist who did drafting in the 1960’s for my dad. I worked on drafting linen with pencil and ink. The linen very smooth, starched and calibered. Does anyone know where I could purchase this or have a recipe for making it myself. Sincere Thanks. Oh Man you guys are in creditable writers on this subject. I came of out of TSTI with AAS drafting technology 1983. (I’m still drafting 35+) I worked on the board from the early 80s up to the start of 90s then on AutoCAD V9,10 I believe the first versions for windows. Anyway I myself was and still am an outstanding mechanical and structural board drafter, I sketch things out for others to draw. Do I think the art is lost? yes I do. You see it has gotten so cost competitive companies no longer can afford to think things through before the drafting begins, they want us to push the button and make it happen. I still think things through which gets me in troubles in the front end but I always get appraised for putting out quality work. So the opportunity to utilize the old philosophy in producing a beautiful piece of work still exist, you just have to sale it and produce it. Project manager’s todays do not set time for pre working out your steps, it just isn’t part of their calculations. If it bits in on the bottom line then you’re in trouble and so is the art of drafting. I took a 10 month drafting course at a technical school and the had 19 years experience designing and drafting mechanical systems for buildings when we switched over to cad in 1988. We started the hard way by learning AutoCAD as we went. At that time there were no people trained in AutoCAD or computers. It was hard at first but we learned, and in learning lost some of the artistry of drafting. Then as the technical schools starting training people to use AutoCAD the industry changed with the new AutoCAD trained staff determining how the drawings were to be done. In that time when companies were struggling to get the work done, you did not have time for the little things that you did by hand. I had to concentrate on developing a system to use AutoCAD without causing a regeneration of the drawing. Those early computers had limited disk capacity or computing speed, not like they do today. The answer was a layer system that allowed you to stack the different floor levels of a building one on top of each other and work your way up and down though the building simply by turning layers on and off. It worked the same way with large buildings that required partial floor plans for plotting. The key was a menu system that managed the layers in the background so you never had to look at a list to change layers. I used layers to isolate the various areas and levels for plotting. I had to trade the art of drafting for the art of system manipulation to produce complete coordinated mechanical building systems as fast and as complete as possigle.